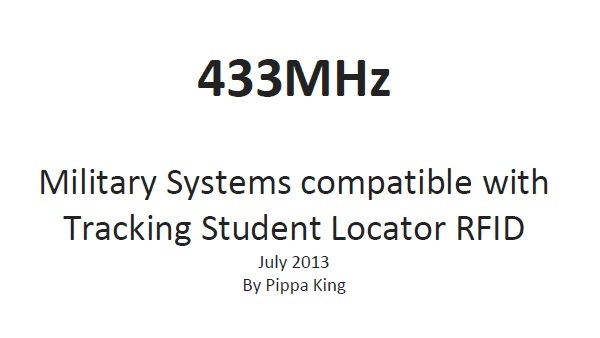 What it did do was made for a good exercise to see how tagging kids with 433MHz – the same frequency used by the Department of Defense, Homeland Security and NATO to track their assets around the USA – worked in a civilian population. With Skyview (aptly named) High School recently installing active RFID tags for staff and students working with wifi 2.4GHz for “safety” reasons, on the back of Sandy Hook, and knowing that RFID to improve attendance is a dead duck in the water, maybe the focus on perceived and totally unproven safety aspects of RFID at NSID may com into play – lets hope not. Sanity, thankfully, has prevailed in the case of Andrea Hernandez who has been incredibly brave standing up to the school’s absolute instance that she wears RFID chip or pretends to and that she stops protesting or she gets expelled. This plucky teenager said no! 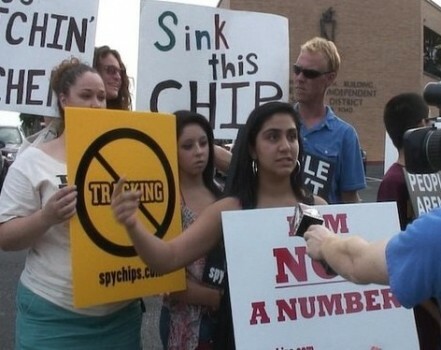 This from the Rutherford Institute who took Andrea Hernandez’s case to court: “A court has temporarily blocked The Northside Independent School District from suspending high school sophomore, Andrea Hernandez, for her noncompliance with a neck badge that monitors student movement throughout the campus via a Radio-Frequency Identification (RFID) chip. “As we discussed, there will be consequences for refusal to wear an ID card as we begin to move forward with full implementation.” Andrea and her family have done really well in this instance, with privacy groups and alternative media highlighting her situation and drawing attention to this heavyhanded approach from the school and school district. A surprising aspect of this case was that the school and the school district were so unwavering in their insistence that Andrea wore RFID. Insistence which seemingly will involve the school paying compensation to Andrea for their discrimination and disregard for civil liberties. The question has to be asked, just what was the school and school district trying to achieve here because this dogged insistence did not seem solely about attendance figures and financial gain. Was the school that desperate to throw away civil liberties for cash? Just what, exactly, are we teaching our kids? Andrea is a shining example of a human spirit standing up for what she believes is right and this has been a very valuable lesson for all students. Children have most probably learnt more from this brave individual than any teacher could have taught them in school about civil liberties.